« WCS – I’m late, I’m late, for a very important date! You might think that an industry that manages to reduce electricity prices, create over 23,000 Texas jobs and reduce air pollution all at the same time might have just about universal support. But no. 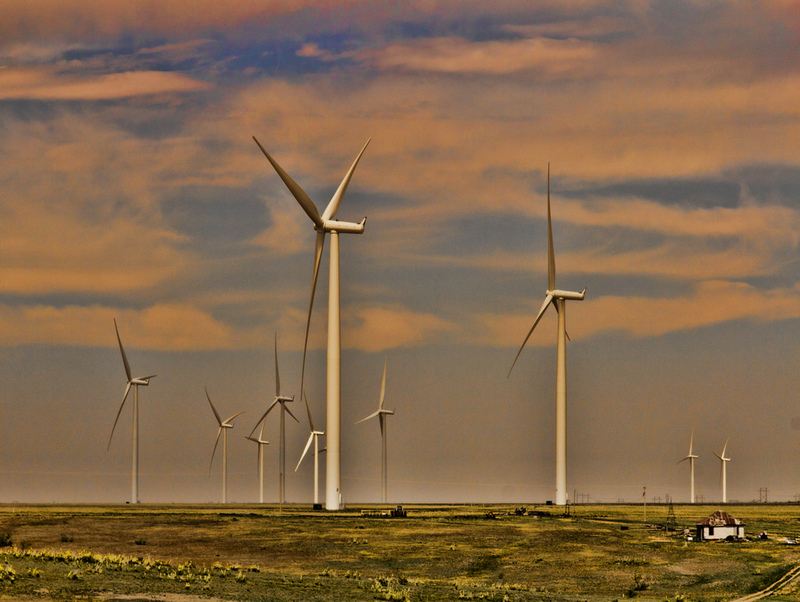 Every time the Texas Legislature is in session, there’s an attack on the Texas wind industry. This session is no exception. Email your State Senator to keep wind energy growing in Texas. Texas State Senator Donna Campbell of New Braunfels is leading the charge against wind energy with Senate Bill 277 (SB 277). The bill would create 35 mile zones around military facilities with aviation operations in which wind farms wouldn’t be eligible for economic development tax credits that are available to many businesses across the state. The stated reason is to protect military facilities and their operations from any interference from wind farms. That would mostly be wind towers obstructing flight paths and the spinning wind turbines causing radar to malfunction. These sound like problems worth fixing until you learn that there’s already a fully functional solution in place. 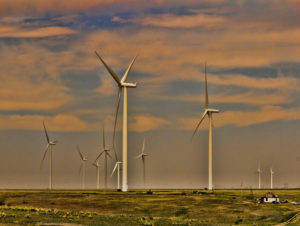 The Department of Defense (DoD) is aware of the potential conflicts between wind farms and other energy infrastructure and it’s operations has has developed a process for evaluating and mitigating any impact from such development. The DoD Siting Clearinghouse examines each proposed wind farm evaluates possible impacts based on it’s specific design and location and the specific activities and infrastructure at nearby military facilities. Generic standoff distances are not useful. Due to the wide variety of missions and the variability of impacts on different types of obstructions, it is not possible to apply a ‘one-size-fits-all’ standoff distance between DOD military readiness activities and development projects. The Clearinghouse process is working. In Nueces County, Texas, a proposed wind farm was evaluated and a determination made that there would be conflict with Navy training missions in Corpus Christi and Kingsville. The Clearing house worked with the wind developer and agreement was reached that allowed the installation to go forward. Turbines were excluded from certain areas and the developer contributed money for studies and infrastructure upgrades. This kind of win-win outcome is the benefit of a thoughtful policy that respects the variability in each situation. 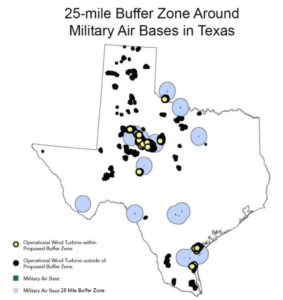 SB 277 gives no consideration to the fact that many wind farms can and do operate within 35 miles of military bases with no conflicts. It’s also possible that a wind farm further away could have impacts. 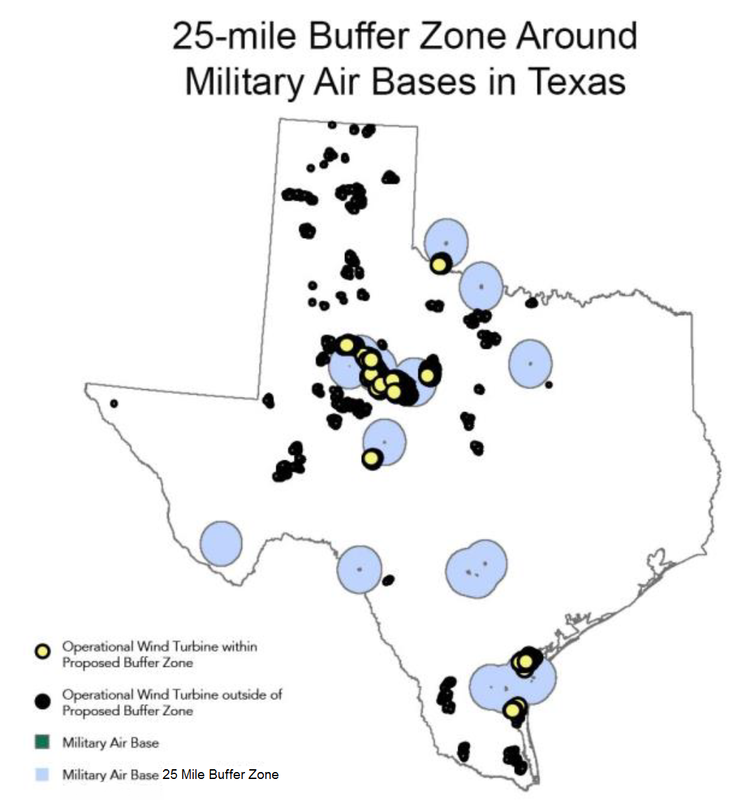 Over 39% of existing Texas wind capacity is found within 30 miles of a military facility. This proposed “buffer zone” is clearly not needed. SB 277 is a bill with a solution for a problem that doesn’t exist.